When I hear people talk about the Middle Ages, I get the impression that most people picture it as a time of mud and dreariness, in which people slogged miserably through their daily lives. While mud would certainly have been a big part of reality, there was also beauty, liveliness, and entertainment. And the wood is springing newly. Sing, “Cuckoo!” Sing, “Cuckoo” now! Now, I do wonder if the whole “farting” thing might have been supposed to be more like “snorting”, but medieval people did like their fart jokes (just watch or read one of their plays, and you can see for yourself!). 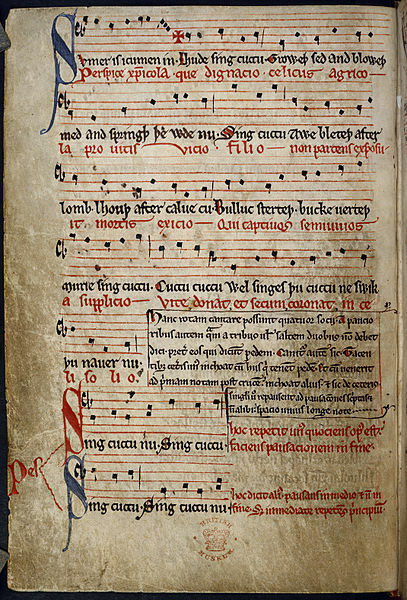 The lovely folks at The British Library have digitized the manuscript in which you can find this lovely song (click here to see it). As you’ll see, it’s beautiful in its red, blue, and black ink, and the musical staff is recognizable – pretty cool, considering it was written in the 13th Century. Also interesting is that there are Latin lyrics under the Middle English ones, but the Middle English ones are given prominence; usually, English played second fiddle to Latin, since Latin was the language of the upper classes. Finally, there are helpful instructions which make it possible for YouTube clips like this one to show you how it would have been sung.